There’s a thin line, if any, between fiction and nonfiction. Often, fiction is just nonfiction through a distorted lens. For me, this has often turned out to be the case, though these areas of modified fact or realism are often difficult to detect. I’ve noticed a trend in my stories that is a prime example of this. My characters always have some “ability” and they always have something “wrong” with them. I come from a family of athletes. In Nigeria, both of my parents are track stars. My father was a nationally known and award-winning hurdler. My mother’s event was the javelin. She was known throughout Africa as “The Golden Girl with the Golden Smile.” She even made the Nigerian Olympic team. So I inherited my speed and quickness from my father and my super strong arms from my mother. My sisters and I were semi-pro tennis players. We are each one year apart. This meant that by high school, we took over the tennis team. It was no real surprise that our team went on to win the State Championship. My last year in high school, after tennis season, I joined the track. I won 22 medals in the 400M, high jump, and 800M. My little brother, Emezie, (seven years my junior) played tennis, too, and is a second degree Black Belt in Tai Kwon Do. Nevertheless, since the age of 13, I had started growing so fast that I developed severe scoliosis. The curvature of the spine. Also hereditary. Technically, it’s a deformity. An old boyfriend (now a close friend) once told me that my back looked like a Picasso painting. When I was a freshman in college, I had to have spinal surgery to straighten it out. I woke up from the surgery paralyzed. Though I regained the ability to walk, my athletic career was over and my spine still has some of its strange “S” shape. During Clarion in 2001, I started writing about this angry Efik woman (Efik is a Nigerian ethnic group) who found she had the ability to fly. She was a Windseeker. Her name was Arro-yo. I didn’t like her much because aside from being kind of mean, she was super promiscuous, and often irrational. But she could fly. She could travel around the world without the use of her legs. In her village, her ability was seen as an aberration, a deformity. You see where this is going? One of my Arro-yo stories was a finalist in the Writers of the Future Contest. Another won The Margin Magical Realism Short Story Contest. Another will be published in a fantasy anthology later this year. About two years later, I wrote Zahrah the Windseeker. Again, you have a character with a “deformity” (her dada hair) and an unbelievable ability. Ejii in The Shadow Speaker has very unique eyes and few people can stand to look into them. She also has the ability to commune with earthy spirits dwelling in shadows. In my short story, “The Albino Girl,” Sunny is an Igbo albino girl who has a special ability. On the flip side, as my experiences can influence my stories, my stories can also have a strong impact on me. My most recent example is a character from my draft of The Shadow Speaker 2 (I had absolutely no intention of writing a part two to The Shadow Speaker. It all just came to me in the last month). This character has very very strong beliefs about the environment and the earth’s beasts and creatures. While writing about him, I was so absorbed into his ideas that two weeks ago I stopped eating meat. Just like that. Granted, environmental issues are very important to me and I’ve always had a problem with eating meat. But it took writing this character to shove me over the edge. We’ll see how long this lasts. It just all goes to show that art imitates life and life imitates art and sometimes they are one of the same. 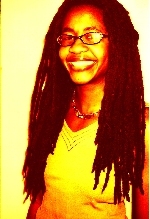 Nnedi Okorafor-Mbachu is a speculative fiction writer whose stories tend to take place in Africa or places like Africa. Her debut novel, Zahrah the Windseeker, was a finalist for the Kindred, Golden Duck and Parallax awards and the Garden State Teen Book Award. Her second novel, The Shadow Speaker, was a finalist for the Essence Magazine Literary Award and an NAACP Image Award nominee. Nnedi’s children’s book, Long Juju Man, is this year’s winner of the prestigious Macmillan Writer’s Prize for Africa. Macmillan will publish Long Juju Man in the fall. Nnedi teaches creative writing at Chicago State University. Read her blog for more insightful comments and to keep up with her new fiction. Very cool. I like how you address how our lives not only inform our fiction writing but how our writing informs our lives too. In the process of “researching” we open ourselves up to new ideas. For some of us, the characters we are writing are like real people, their voices inhabit our brain and we have a picture of them and everything. So it is kind of like interacting with a new person we’ve just met, getting to know them, and challenging our own ideas and perceptions by “hearing” about theirs. During Clarion in 2001, I started writing about this angry Efik woman (Efik is a Nigerian ethnic group) who found she had the ability to fly. She was a Windseeker. Her name was Arro-yo. I didn’t like her much because aside from being kind of mean, she was super promiscuous, and often irrational. But she could fly.